Home » 2018 » March » 01 » Where did I come from and where am I going? As a Ph.D. student who spends a lot of time reading very long and theoretical articles, it’s can sometimes be easy to lose perspective on where I’ve come from and where I ultimately want to go with my work. So in taking a break from some of the reading, I thought I’d spend a few minutes sharing my story and describing how my past is currently influencing my work. 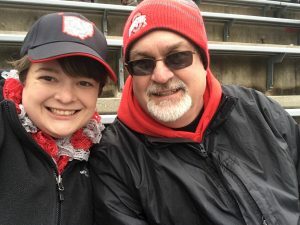 My dad and I have always been close and have a lot of great memories together, but some of them that I cherish the most are the times that my dad taught me about math. Now, I don’t want you to get the picture in your head that we sat down and he started lecturing on fractions, or graphs, or calculus—that couldn’t be further from the truth. The lessons my dad taught me in math always revolved around games. He taught me that if I was using logic, I should never lose at tic-tac-toe. We played Mastermind, backgammon, and checkers—all while talking about strategy and potential outcomes. When I got older and was trying to become a better softball player, he would point out that my throw had way too much of an arc in it and that my sometimes creative ways of trying to catch the ball were not using geometry in my favor. Playing games of pool (billiards) together also included lots of conversation about velocity and angles. Here’s a picture of me and my dad. 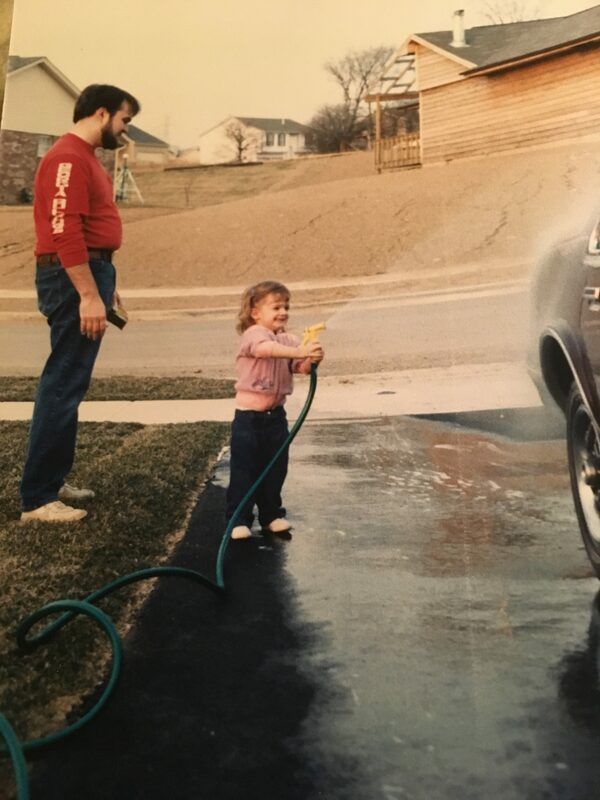 I don’t remember this specific day, but I wouldn’t be surprised if he told me about the correct angle to hold the hose at. My dad and I now. 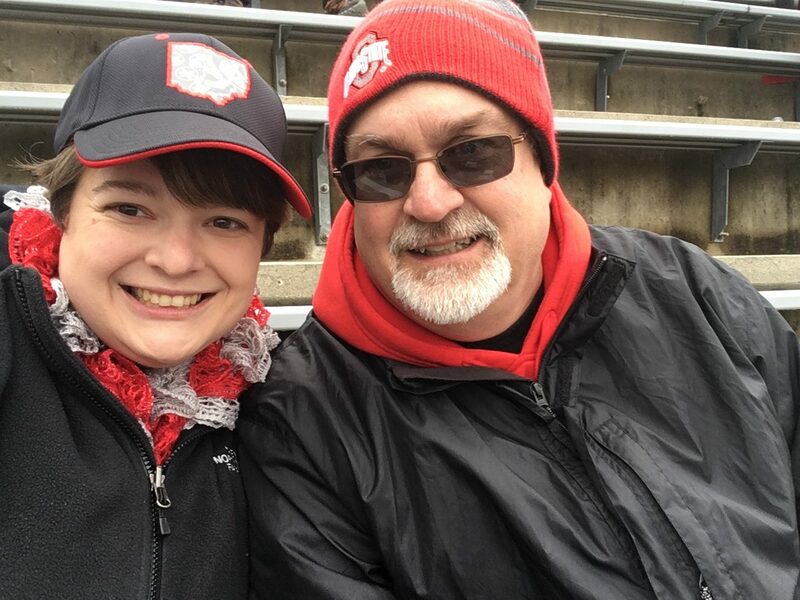 He’s still a great person to bounce ideas off of while waiting to watch the Buckeyes play football! O-H! These memories with my dad have deeply impacted how I view mathematics. I’ve always seen solving a math problem or writing a proof as a puzzle or a game. It also showed me that math is everywhere and could help me think of solutions in surprising ways. I’ll come back to this in a minute, but he was also a perfect person to discuss math with—since he was around me every day, he knew how I thought, what I thought was funny, what motivated me, what I was curious about—he could help me think more deeply about any problem (both math and not math), because we have a special connection. Now I have a child of my own. He’s currently in preschool. Like many parents, I show my kid things that I’m interested in. Unlike most parents, for me that is math. Just like my dad did with me, I play a lot of “math” games with my son. There have even been times he’s beaten me at tic-tac-toe (don’t tell my dad! I claim it was because I was distracted or sleep deprived!). There are also so many great games for kids now. SET Junior and Tiny Polka Dot are our current favorites. These games give us a chance to hang out together and enjoy each other’s company—there’s always a lot of giggling. They also give me a chance to learn how he thinks—like all young children, he thinks more deeply about mathematics concepts than is usually visible to adults. So where am I going with all of this? Reflecting on the memories with my dad and the ways that I enjoy talking with my son about mathematics has been a driver in my work lately. I think that technology (specifically iPad apps) could help all parents, even those who have been anxious about math, connect with their child’s mathematics thinking. 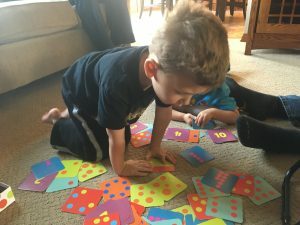 I’m working on developing an app that allows young children and their parents to sit down and talk about math together—all in a play-based way. Preliminary research on the use of the app has shown that when provided with questions to ask their children, parents are amazed and excited to see the ways that their young children can explain their thinking. As I foreshadowed earlier—I believe that parents can use their close relationship with their child to unlock and discover their thinking. If you’re reading this: What math experiences did you have as a child? Did you ever discuss math with your parents? My fondest memories of math were when I got to spend an entire afternoon with my Auntie Kay. She was a retired teacher and had a whole closet full of math games and puzzles. She’ d stack the games up at the end of the table and we would sit facing each other and play one game after another after another after another, just the two of us and some tea and pastries. I think back on those afternoons and all the intense problem solving and thinking I did, playing games like Mastermind, Othello, and other puzzles. In retrospect, my Aunt Kay was really instilling a love of mathematical thinking in me and continually challenging me to think harder in the guise of fun and love. I don’t ever remember having the same sorts of interactions around math with my parents, though.